As the world ponders the implications of the U.S. midterm elections–and the resulting Republican majority in the Senate, I thought I’d post a visual clue to its meaning. Sortition advocate Zach Roberts has kindly given me permission to reproduce a chart he created. 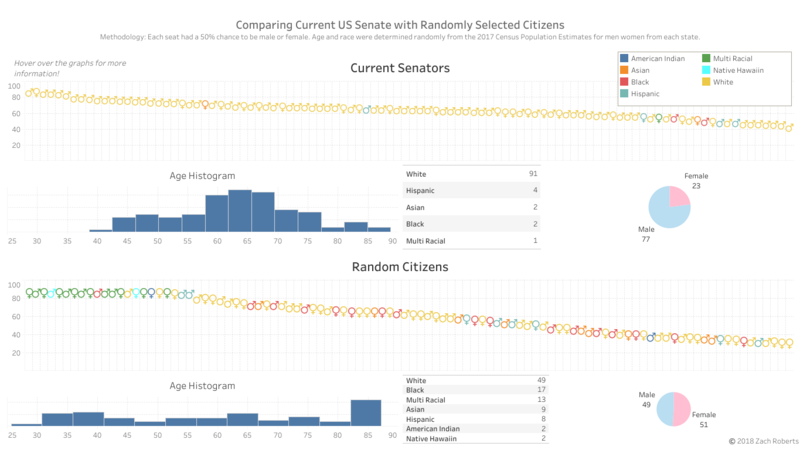 It shows that the distribution of seats typical in the U.S. Senate has little to do with the make-up of the electorate. For further details on the chart, check out the Sortition Foundation’s web page. Chart showing the likely diversity of representation under a sortition system. Meanwhile, I’ve been doing my own pondering about elections closer to home. British Columbia, where I live, is conducting an electoral reform referendum. Voters are asked to mail in a ballot by Nov. 30. They can select either the current first-past-the-post system or proportional representation. The problem is that neither system would eliminate political campaigning. Neither would stop politicians from backtracking on their election promises. Canadian Prime Minister Justin Trudeau is a case in point. He backed away from his campaign promise to change the electoral system, presumably because his large majority government has made him feel quite secure in his job. In a 2017 Edelman poll only 43 percent of Canadians said they trusted the government and 61 percent said they lacked confidence in the country’s leadership.How can you trust the people in government if you can’t trust their promises? Zack Roberts’ chart showing representative diversity possible through sortition. British Columbia has a chance to push up the confidence level–a little bit. If the referendum’s 50 percent threshold sees a PR win, the imbalance, as suggested by Roberts’ chart, may lessen somewhat. However, the members of the B.C. Legislature selected under proportional representation would still be politicians. A sortition system would end political campaigning and replace it with a random selection process for our legislators. It would be like the jury system, which began in medieval times and has worked exceedingly well. Interestingly, Andrew Wilkinson, leader of the BC Liberal Party, proposed a sortition system in a debate Nov. 8 with New Democratic Party leader John Horgan. Wilkinson, who favors first-past-the post, objected to proportional representation because, he said, the type of PR system should have been worked out by a citizens assembly, and not by politicians. A citizens assembly is a randomly selected group of voters; hence it’s a sortition system. Cheers to Wilkinson for suggesting that. Let’s go a step further and opt for sortition in the selection of legislators such as Wilkinson and Horgan. Of course, they are politicians and would probably lose their jobs. In the meantime, proportional representation would take the province a tiny step closer to a truly representative government. I’m voting for that. But the greater goal should be not to vote at all and let randomness–with no one beholding to no one–do the job.